Nostalgia sells. It’s a big business, the only time looking backwards pays off and doesn’t leave sprawled at the foot of the lamppost you didn’t see. Football is a curious industry, a business built on the endeavours of predecessors but eager to ignore them, overly keen to erase term from the consciousness. Fans play into the hands of broadcasters whose profits rely on promoting the present and casting theast to the cutting room floor. Beyond The Big Match Revisited And the official FIFA films rerun yo whet the appetite for the World Cup, I cannot think of anything recently shown which celebrates football’s heritage. Golden Gordon from the Ripping Yarns series, perhaps. Andrew Smart doesn’t go that far, preferring to commemorate a time when the hard men of the pitch would leave their victims genuinely hurt not writhing with the feigned injuries of today. A decade when the troubles of the terraces seemed to be dragging the fame into disrepute and oblivion, finishing the job the England team had already started. It’s where Smart begins his journey, Mexico 1970 complete with the tribulations and ignominy that followed in the next ten years. The shabby treatment of Sir Alf by then FA Chairman, Harold Thompson, sums up one of the biggest problems of the era; administrators with egos. Some things never change, no matter how much money glows through the game. His successor, Don Review, is given short-shrift with his devious departure once more paraded in its monetary glory. Scorned women may be the most furious creatures according to received wisdom, Revie quickly found newspaper reporters, columnists and editors are not far begins them. For some of us, football then was the Awayday Special, Oxford Bags and tank tops, the sartorial elegance to which Adrian Chiles aspires. That was a different part of the game, scarves around the wrist the signal of the unsavoury element which is why in some respects, this is a challenging book; just as your mind wanders, the end comes and the direction changes. It’s a problem that the author can do little about, tackling a decade in football is a tough job when go cussed on one club but a whole nation? It’s a tall order but in this instance, the writing takes a leap higher than Jack Charlton could manage at Layer Road. It was the FA Cup’s final hurrah for glory and one in which Arsenal prominently featured, not always girt god right reasons. Cup final glory us reflected in equal measure with the failures, defeats in previous rounds mentioned in passing as the likes of Sunderland and West Ham went on to greater things. 1970/71 merits its own chapter, Bertie Mee’s accession to the throne briefly covered, the prelude to a season that ended in the ultimate accolade, The Double. The squad is painted as they were created, honest, hardworking with plenty of ability although I wonder if Pat Rice will be pleased to be described as “craggy“, even now. The player achievements are credited but Mee is the focus, highlighting his importance to the club and the game in question. For Smart, a veteran of East Midlands reporting, there seems a genuine and touching affection for local boy made good. The Arsenal double leads into Liverpool’s boot room and onto the favoured sons of Clough and Taylor, with credit to Jimmy Gordon for completing the East Midlands Holy Trinity. Every time you read the Derby and Forest stories of that era, they become more difficult to believe. Two clubs whose fortunes were on the downturn, revived by three men, winning titles (and cups in the latter’s case) with the front man’s credit hugely reliant on his quieter partners. It’s often forgotten how close Derby came to winning the European Cup in 1974, falling foul of the dirty tricks that have caused the media to meltdown in this World Cup. With many trips down memory lane, the dark side of the game is often overlooked. It isn’t here; hooliganism is an over-riding memory of the decade and Smart doesn’t shy away from bringing the violence of the era back from the past. As he rightly observes, this was a time when many people’s first game was also their last. That is a recurring them; the vandals of the terraces have been replaced by those in the boardroom and hikes in ticket prices are in danger of losing a generation outside of the top four. Football, as then, is in danger of becoming less of a spectator sport. There are some minor errors – Geoff Barnett, not Bob Wilson, kept goal in 1972’s FA Cup final, Graham to United not QPR whilst The Simod Cup was a decade later; the Texaco and Watney Cups were more than enough in their pointlessness. But these things bring the anorak out and not irritate, as your mind becomes a swirl of clippers, choppers and curly before the wurly’s stature diminished. It’s the literary equivalent of a Match of the Seventies boxset and that’s no bad thing at all. You can buy Best, Pele and a Half-Time Bovril here . It doesn’t matter how old you are. It doesn’t matter whereabouts in the world you are. If you are a football supporter, there is a strong chance that you will have heard the name Stanley https://www.aclfarsenal.co.uk/wp-admin/post.php?post=14945&action=edit&message=10Matthews and know his place in the pantheon of English football. The oldest player in a league match, finally hanging up his boots when most Sunday League players had done so years before. The 1953 FA Cup final. How on earth are you supposed to distil a thirty year playing career into a peak and prime when the player in question was still being capped by his country at the age of 42, twenty-three years after it had begun, and winning promotion with Stoke City when older than I am now as I write this. It was a unique and most likely, unparalleled career. With his almost mythical status, much of Stanley Matthews life is already know. Certainly from the playing side at least and it is to Jon Henderson’s credit that he brings a freshness to the prose when relaying those stories and tales of derring-do on the football pitches of the world. Matthews was ahead of his time in dietary awareness and probably ahead of a few players nowadays, eschewing the stereotypical football lifestyle of beer and steak for almost monastic existence in terms of nutrition and supplements. Given the longevity of his playing career, he obviously did something right in enhancing his biological disposition toward fitness. The 1953 final is often people’s most vivid – only – memory of the footballer and Henderson brings other matches to mind when assessing Matthews best 90 minutes. Pele observed that the winger “taught us the way football should be played” and with that, the contention that the 1958 meeting with Brazil at Wembley was one of the finest, gains traction. Does it really matter what we think were the best moments of a playing career? After all, there are many matches which mean different things to different people. A dispassionate football report does nothing to capture an individual’s mood and more often than not, that is what makes the occasion special. As with most talented footballers, management proved the opposite. Matthews stint at Port Vale was most notable in Arsenal minds for his rejection of Ray Kennedy. Thankfully he did and Arsenal reaped the benefit. Indeed, during his reign, the Potteries club were banned from the Football League due to financial irregularities and it was up to him to use the persuasion of his name to have Port Vale re-elected. For a man who was astute in exploiting his financial worth whilst playing, it stuck in his craw to be taken advantage of whilst being owed thousands of pounds by the club in unpaid wages. Having reached a settlement with them, he vowed never to work in English football in a managerial capacity again. All the while this was going on, he stayed to help Vale’s youth footballers; the love of the game was too strong. With so much familiarity, there is a refreshing burst of, well, if not revelations, certainly adding more colour to the man himself. It seems somewhat fitting that having lived and played through real and political wars, Matthews second wife turned out to be a former spy for the Czechoslovakian security services. It was about the only thing missing from the tales and would make a wonderful if somewhat improbable Hollywood tale. It’s an enjoyable read on a life less ordinary. Click on the link to buy the paperback or Kindle versions of The Wizard: The Life of Stanley Matthews. With the debate about Wenger’s tactics and formations reaching fever pitch ahead of the new season, this book is definitely a good point for you to leap into the history of football’s tactics. To make the claim that you are tracing the history of football tactics is grand indeed. Jonathan Wilson through his blog on The Guardian has proven himself more than up to the task on a weekly basis. To his credit, the high standards set in his weekly column do not drop in a fascinating trawl through the game’s magnificent and monumental history. Having started from an after dinner debate using the traditional condiments as props, Wilson follows the path of the 1-2-7 from its attacking roots through 2-3-5, WM, 4-2-4, 4-4-2, 3-5-2 to the various loops and circles of the modern day. The diversions into 4-1-4-1, 4-1-3-2 and so on are all given a historical environment, making more sense of their development that the blandness of a chalk or white board can ever convey. Crossing continents from Europe to South America, a dry subject is given life and a consistent pace that comes from a knowledgeable and well-researched author. My own favourite spell of the football’s history – the Austrian Wunderteam and the Hungarian Aranycsapat – are covered in some depth, their roots in the British pioneers who influenced the key figures are dutifully anotated, the reasons for the premature ends well documented. Crucially, no-one person, country, club or team is given more credit than they are due. The influence that individuals have over their time duly recorded with all deferrence. Comparing and contrasting the legacies is where Wilson excels, judgements well considered and logical in their conclusions. Catenaccio, with its much misunderstood implementation and legacy, is given the same credit as any outright attacking invention, Herrera no more prominence than Sacchi or Lobanovskiy. From an Arsenal perspective, Herbert Chapman is given significant recognition over the dominant side of the early 1930s. Even if the creator did not survive to witness all of their glory, the manager’s influence is still felt to this day. W-M was not a universally popular formation with the authorities, a run in with those in power that echoed Chapman’s past, but the success enjoyed using it meant the tactics were replicated around the globe. Even George Graham is given credit for the European campaigns of the mid-90s although intimating that the five man midfield was a short-passing is perhaps stretching the dourness of those cup runs a tad far, irrespective of the glory that followed. Wilson is correct in his conclusion that the tactical innovations which have had the greatest impact will never be replicated in the game due to the extensive analysis carried out at the major clubs and universities around the world unless the sport changes the number of players. The prevalence of television and video technology means no more surprises can be sprung on an unsuspecting world. A pity but it does have a benefit for the author since this work will no doubt remain the authority on the subject for many years. There is an old English saying that probably translates to other countries, “There is always someone worse off than you”. 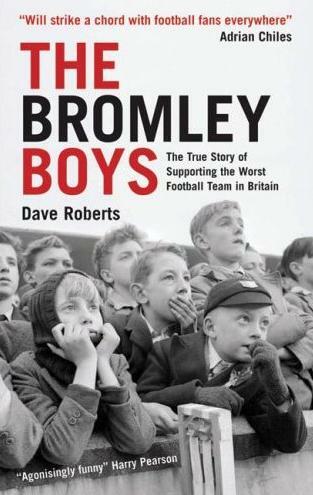 Bear that in mind when looking at perceived ills of Arsenal, for Bromley in 1969/70 the only team fitting that particular bill was Corinthian Casuals, who hamstrung themselves by not paying any fees or wages at all to their players. They were bottom, Bromley one place above them. This is a story of that one season. Matches been “lovingly” recreated in this enjoyable tale of a fourteen year old boys obsession with his local football club, intertwined with his own travails. Enjoyable for the reader, for it must have been pure hell for the players and supporters. The whole gamut of footballing excuses are brought forward from shockingly sub-standard players, bad luck and poor officiating being the root cause of the woes besetting the Isthmian League club. It is a different angle than reading of one person’s trials and tribulations in a successful season of one of the bigger clubs. Those who have encountered the hardy souls that inhabit the semi-professional game will recognise some of the companions that accompany Roberts on this trip, they have their soulmates in the professional game as well. Their emotions are the same, the lows plummeting to same depths that the you or I do when Arsenal are involved, the highs far outpeaking ours simply for their scarcity. It is said that there is a more anorakish element to the non-league game, something that is hard to believe given that Roberts own scrapbook-keeping and programme collecting are no more nor less different to those of a number of adolescents besotted by football. As for the subbuteo tournaments, well, it brought back memories of rain and snowswept afternoons when inclement weather prevented the usual kickabout. Roberts mixes his own influence upon the club, from the terrace to the Xanadu of the Supporters Club Bar, with his school life, dominated by being asked to leave his private school to the local skinheads, unrequeited love, Arsenal and a disliking of purported love rival Jon Sammels. Aside from the dedication of travelling distances by bus or bike, his major achievement is persuading an Arsenal supporting friend to trade a visit to Arsenal for a similar visit at a lower standard. It is hard to guess which was more unimpressive, Roberts serving in the tea hut all game or the fare on offer. That one of his friends vows never to go again after yet another defeat, only to turn up again on a regular basis shows the vice-like grip with which football grabs you. It is a charming tale, the recollection of matches testament to the author’s diligent notetaking at matches. A recommended read for all, especially with the festive seasons approaching. On a daily basis, television screens and the internet spew forth details of those lives torn apart by wars, famines and other natural disasters, displacing them into refugee camps and beyond. Rarely, if ever, do we see the other side of the story, what happens to those who pass through the camps and are resettled. Outcasts United is a small glimpse into that territory. The book is situated in a small city close to Atlanta, Georgia, which during the 1990s became a refugee settlement centre. Describing Clarkston is like a journey into stereotypical small town America, white picket fences and all. The collision between the multitude of cultures erupts into the struggle for identity with prejudices regularly surfacing against the newcomers. Luma Mufleh is the pivotal figure. A young Jordanian woman from an affluent background in her homeland finishes her education in the USA. Having done so, in 1997 she decided to remain in the country. Working her way southwards from Boston, she arrived in Atlanta’s suburbs, for no apparent reason other than the fact that she liked the climate. She arrived in neighbouring Decatur and found a job coaching youth football. After a while, on a shopping trip, she stumbled upon a group of refugees playing football in Clarkston. This led to the creation of a football program in town, the initial premis being that Mufleh could run this alongside her existing commitments. That events did not turn out that way is unsurprising. Each player in the story has their background explained, how they arrived in Clarkston. It is not hard to see why there is distrust between refugee communities and their hosts. Having escaped persecution in their homelands, the encounter a wall of prejudice that slowly changes but still remains in certain areas. There are encounters with corrupt policemen and incompetent politicians, NIMBY’s and hostility, all of which increased the fear and alienation already felt. Mufleh acted as mother, friend, translator and mentor to the children and families. From the outset, a set of rules was drawn up that all players were expected to adhere to. Transgression brought exclusion from the team. Having little experience of coaching, she learns from her mistakes, too much lattitude here followed by strict enforcement, to the extent that one team was disbanded. She committed herself to the teams and expected the same in return, more often than not receiving it. The central theme of the book is the inclusivity that football engenders. Regardless of colour, creed or any other denominator, all are welcomed, few excluded. This is not an in-depth psychological analysis, simply the story of how one human can inspire others, to escape whatever domestic ills may have befallen them. The narrative is from the coach’s perspective with the children providing a nice counterbalance along the way. Whilst the Rothman’s (now Sky) Football Yearbook is rightly considered the authority for domestic football, The European Football Yearbook is heading in that direction for the continental game. It has changed considerably since it first emerged over a decade ago, increasing the content in depth and with the backing of UEFA, this is a weighty tome, similar in size to that of its UK counterpart. As you would expect, all of the UEFA competitions, both club and national, are given the opening chapters – 2008 was an excellent year for Spain in a number of those, not just Euro2008 – taking advantage of the glossy page format for the inclusion of photos and text. The mix of commentary and pure results works well for the book, taking the reader through the early stages to the culmination, capturing triumph and despair in equal measure. The major content of the book consists of a record of last season in all of the top flights across UEFA’s member countries, equal attention given to each league from the results to squad details for each club as well as the table for the second tier and domestic cup results. If you want to know how Dynamo, Porto and Fenerbahce’s form last season at the stage when they face Arsenal, it is here. Equally, you can find FC Dinamo Bender’s record in Moldova or that having ‘Hotspurs’ in your club name is quite damaging, as Pielta Hotspurs of Malta found out in being relegated last season. Following on from the club guide is a section of the top 100 players from last season; Adebayor, Fabregas, Flamini and Hleb are those from that Arsenal squad chosen for the pen picture and paragraph treatment. The book’s final section is that of a geographical representation of every nation’s participating club and UEFA calendar, completing a comprehensive review of European football.